Odawara (小田原市, Odawara-shi) is a Japanese city in Kanagawa Prefecture on the island of Honshū. It has been recognized as a special city since 2000. In the Edo period, Odawara-juku was 9th of the 53 shogunate-maintained waystations (shuku-eki) along the Tōkaidō road which connected Edo and Kyoto. During the Great Kantō earthquake in 1923, most Odawara buildings collapsed immediately; and fires burned anything left standing. 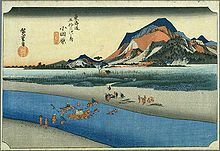 The borders of Odawara are the Hakone Mountains to the north and west, the Sakawa River to the east and Sagami Bay to the south. ↑ Nussbaum, Louis-Frédéric. (2005). "Odawara" in Japan Encyclopedia, p. 735. ↑ Hammer, Joshua. (2006). Yokohama Burning: The Deadly 1923 Earthquake and Fire that Helped Forge the Path to World War II, p. 113. Wikimedia Commons has media related to Odawara, Kanagawa. This page was last changed on 31 August 2017, at 09:07.